Washingtonia filifera, known also as California Washingtonia, Northern Washingtonia, California fan palm, or Desert fan palm. Washingtonia robusta also known as Mexican Washingtonia, Southern Washingtonia or Thread Palm. Native areas: Washingtonia is a genus of palms, native to the southwestern United States and northwest Mexico Both Washingtonia species are commonly cultivated across the southern USA, Middle East, southern Europe and north Africa, where they have greatly hybridized. The filifera species is also attempted in cooler climates, including the milder parts of the southern British Isles. Historical notes: There is a persistent myth that these palms were brought to the Americas by the ancient Egyptians and their seeds were distributed in the waterways of the Western Californian area. The fruit of the Washingtonia was eaten raw, cooked, or ground into flour for cakes by native Americans. The Cahuilla and related tribes used the leaves to make sandals, thatch roofs, and baskets. The stems were used to make cooking utensils. The Moapa band of Paiutes as well as other Southern Paiutes have written memories of using this palm’s seed, fruit or leaves for various purposes including starvation food. Features: They are fan palms, with the leaves with a bare petiole terminating in a rounded fan of numerous leaflets. The flowers are in a dense inflorescence, with the fruits maturing into a small blackish-brown drupe 6–10 mm diameter with a thin layer of sweet flesh over the single seed. W. filifera can grow to around 23 metres tall, whilst robusta gets up to 25 metres. W. filifera has white flowers and large leaves and robusta pale orange-pink flowers, smaller leaves and narrower trunk. The fruit are eaten by birds, which disperse the seeds in their droppings after digesting the fruit pulp. Uses: Both species are cultivated as ornamental trees, as specimens, or more often in groups along side roads, in parks and other such open spaces. W. robusta is suitable for coastal gardens. Growing conditions: W. filifera is very hardy in a dry climate and able to survive brief temperatures in the vicinity of -15 °C (5 °F), provided the air and soil are not too wet, and the afternoon temperatures are not too cold. Intolerance of wet, prolonged cold is the main reason the filifera species cannot grow properly in temperate marine climates. W. robusta is less sensitive to moisture than filifera, grows faster, but is far more easily damaged by cold. Grow outside in fertile, well-drained soil in full sun. This wonderful tree, native to the U.K., is often associated with Scotland. It certainly suits bird life as the profuse red autumn berries provide a lot of autumnal sustenance. As they are not regular in shape, the parent Rowan can be grown as a multi-stemmed specimen to achieve more uniformity of shape, or alternatively one of it’s clones, such as Sorbus aucuparia ‘Rossica Major’ can be used. Common name: Rowan , Mountain Ash (due to the fact that it grows well at high altitudes and its leaves are similar to those of the ash, Fraxinus excelsior – however, the two species are not related). It’s latin name is composed of Sorbus for ‘service tree’ and aucuparia, which derives from the words ‘avis’ for “bird” and ‘capere’ for “catching” and describes the use of the fruit of S. aucuparia as bait for fowling. Native areas: The Rowan can be found in almost all of Europe and the Caucasus up to Northern Russia and Siberia, but it is not native to Southern Spain, Southern Greece, Sardinia, the Balearic Islands, the Azores, and the Faroe Islands. The species was introduced as an ornamental species in North America. Historical notes: Fruit of S. aucuparia were used in the past to lure and catch birds. To humans, the fruit are bitter but they can be debittered and made into compote, jelly, jam, a tangy syrup, a tart chutney, or juice, as well as wine and liqueur, or used for tea or to make flour. The robust qualities of S. aucuparia make it a source for fruit in harsh mountain climate and Maria Theresa of the Austrian Habsburg Monarchy recommended the planting of the species in 1779. The colour red was considered to be the best colour for fighting evil, and so the rowan, with its bright red berries, has long been associated with magic and witches. Its old Celtic name is ‘fid na ndruad’, which means wizards’ tree. In Ireland it was planted near houses to protect them against spirits, and in Wales rowan trees were planted in churchyards. Cutting down a rowan was considered taboo in Scotland. The wood was used for stirring milk to prevent it curdling, and as a pocket charm against rheumatism. It was also used to make divining rods. The tallest S. aucuparia in the United Kingdom stands in the Chiltern Hills in South East England. This exceptional specimen is 28 m tall and has a trunk diameter of 56 cm. Features: Sorbus aucuparia occurs as a tree or shrub that grows up to between 5 and 15 m in height. The crown is loose and roundish or irregularly shaped but wide and the plant often grows multiple trunks. The trunk is slender and cylindrical and reaches up to 40 cm in diameter, and the branches stick out and are slanted upwards. The bark of a young S. aucuparia is yellowish grey and gleaming and becomes grey-black with lengthwise cracks in advanced age; it descales in small flakes. Lenticels in the bark are elongated and coloured a bright ochre. 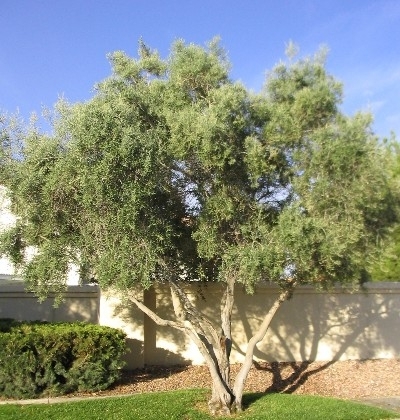 The plant does not often grow older than 80 years and is one of the shortest-lived trees in a temperate climate. Growing conditions: S. aucuparia is an undemanding species and can withstand shade It is frost hardy and can tolerate winter dryness and a brief growing season. The plant is also resistant to air pollution, wind, and snow pressure. S. aucuparia mostly grows on soil that is moderately dry to moderately damp, acidic, low on nutrients, sandy, and loose. It often grows in stony soil or clay soil, but also sandy soil or wet peat. The plant grows best on fresh, loose, and fertile soil, prefers average humidity, and does not tolerate saline soil or waterlogging. It can be found in light woodland of all kinds and as a pioneer species over fallen dead trees or in clear cuttings, and at the edge of forests or at the sides of roads. This is a small tree (which can also be grown as a shrub) that can be a bit of a thug, as it spreads freely by root extension, but it’s lower growth is thin enough to allow other plants to live alongside it. I have a few here at Old School Garden and it is a great tree for adding an oriental feel, has interesting foliage (especially in the autumn) and some unusual flowers. Native areas: It is primarily found in Southeastern Canada, the Northeastern and Midwestern United States and the Appalachian Mountains, but is widely cultivated as an ornamental throughout the temperate world. Historical notes: Introduced to the U.K. in 1620’s it won the R.H.S. Award of Garden Merit in 2002. Some beekeepers use dried sumac bobs as a source of fuel for their smokers. The fruit of sumacs can be collected, soaked and washed in cold water, strained, sweetened and made into a pink lemonade. The leaves and berries have been mixed with tobacco and other herbs and smoked by Native American tribes. All parts of the Stag’s horn Sumac, except the roots, can be used as both a natural dye and as a mordant. The plant is also rich in tannins and can be added to other dye baths to improve light fastness. In both French and German, the common name of the species (Sumac vinaigrier, Essigbaum) means “vinegar tree”. Features: Rhus typhina is a deciduous shrub or small tree growing to 5 m (16 ft) tall by 6 m (20 ft) broad. It has alternate, pinnately compound leaves 25–55 cm (10–22 in) long, each with 9–31 serrate leaflets 6–11 cm long. The leaf petioles and the stems are densely covered in rust-colored hairs. The velvety texture and the forking pattern of the branches, reminiscent of antlers, have led to it’s common name. The Sumach is dioecious (male and female flowers produced on separate plants), with yellow-green flower clusters, followed on female plants by dense crimson fruiting heads. 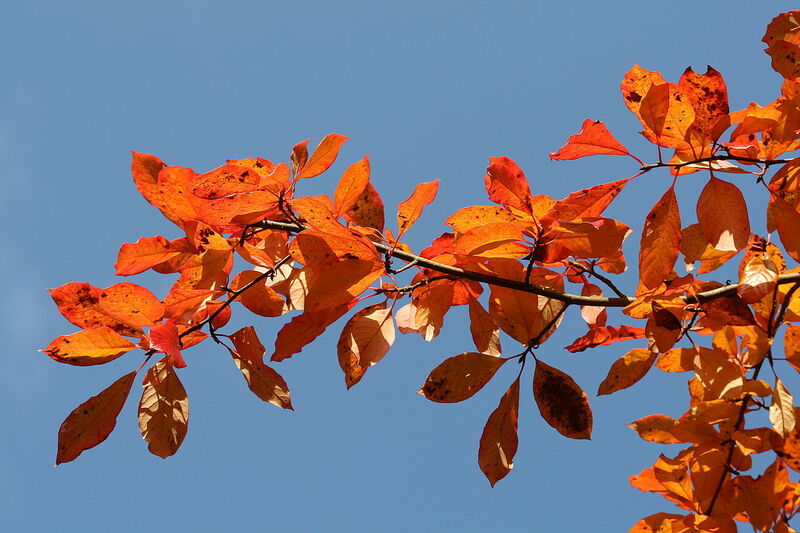 Uses: Rhus typhina provides interest throughout the year and is spectacular in autumn when its foliage turns fiery orange, gold, scarlet or purple. The effect is greater when set against the dense cones of red fruit borne by female plants. To get the best from this autumn colour plant it in a sheltered position away from strong winds; otherwise, as here in Old School Garden, you won’t see the leaves for very long! It’s vigorous, suckering habit makes it unsuitable for smaller gardens. Some landscapers remove all but the top branches to create a “crown” effect in order to resemble a small palm tree. There are about 200 species of Rhus and numerous cultivars have been developed for garden use, of which ‘Dissecta’ (syn.’Laciniata’ or Cutleaf Stag’s Horn Sumac) has deeply cut leaves. ‘Dissecta’ will survive winters as low as minus -12°C and then regain new growth the following season. Growing conditions: It can grow under a wide array of conditions, but is most often found in dry and poor soil on which other plants cannot survive. Some species can be pruned hard to the ground every other year in early spring to produce handsome foliage plants. The inner sections of the trees are woody and pithy . It is advisable to wear gloves because the sap is potentially harmful. So many trees beginning with ‘P’- which to choose? 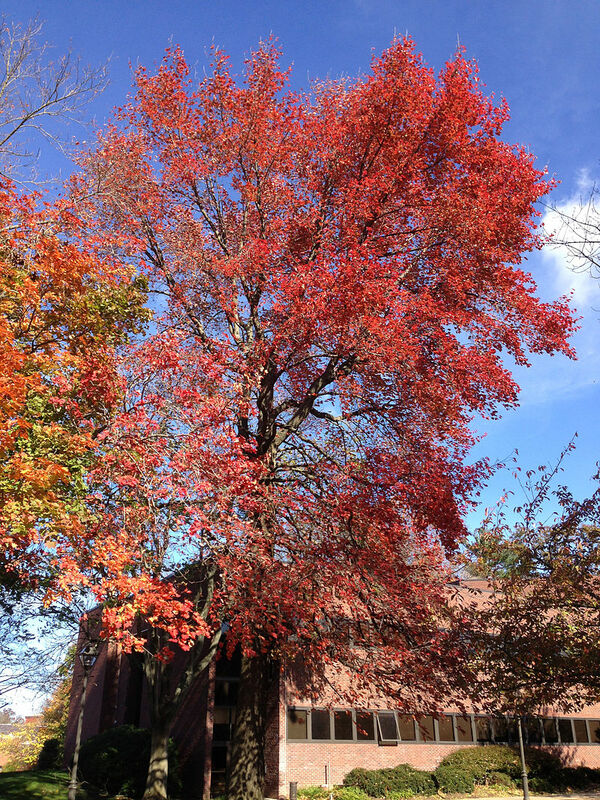 My choice is a tree that poses a dilemma- to prune or not to prune? If you do, you will encourage massive foliage which is a fabulously exotic addition to any garden. Alternatively, don’t and you get some wonderful flowers…the choice is yours. Native areas: Pawlonia tomentosa (syn. P. imperialis) is native to Japan and central and western China, where it has become virtually extinct due to a pathogen. It has become very common in North America, where it is considered an exotic invasive species. It was introduced to the UK in 1834. Historical notes: The tree was named after Anna Pavlovna, daughter of Tsar Paul I and wife of Prince Willem of the Netherlands. In China, the tree is planted at the birth of a girl. The fast-growing tree matures when she does. When she is eligible for marriage the tree is cut down and carved into wooden articles for her dowry. Carving the wood of Paulownia is an art form in Japan and China. In legend, it is said that the phoenix will only land on the Empress Tree and only when a good ruler is in power. Several Asian string instruments are made from P. tomentosa. The soft, lightweight seeds were commonly used as a packing material by Chinese porcelain exporters in the 19th century, before the development of polystyrene packaging. Packing cases would often leak or burst open in transit and scatter the seeds along rail tracks and near to ports. The magnitude of the numbers of seeds used for packaging, together with seeds deliberately planted for ornament, has allowed the species to be viewed as an invasive species in areas where the climate is suitable for its growth, notably Japan and the eastern United States. Features: Paulownia tomentosa is an extremely fast-growing tree; its growth rings have been measured at three every inch. However the UK’s climate slows this down, and any growth under a pencil thickness generally succumbs to winter frosts, and which in turn contribute to its overall broadness. It will ultimately grow to 10–25 m (33–82 ft) tall, with large heart-shaped to five-lobed leaves 15–40 cm (6–16 in) across, arranged in opposite pairs on the stem. On young growth, the leaves may be in whorls of three and be much bigger than the leaves on more mature growth. The leaves can be mistaken for those of the Catalpa. The very fragrant flowers are formed in autumn and then open in spring before the leaves in early spring (May), on panicles 10–30 cm long, with a tubular purple corolla 4–6 cm long resembling a foxglove flower. However, if there is a prolonged period where winter temperatures fall below minus 5 degrees celsius, no flowers will develop the following spring.The fruit is a dry egg-shaped capsule 3–4 cm long, containing numerous tiny seeds. The seeds are winged and disperse by wind and water. Pollarded trees do not produce flowers, as these only form on mature wood. A mature tree in its native environment can produce up to 20 million seeds a year! Uses: P. tomentosa is cultivated as an ornamental tree in parks and gardens. It has gained the RHS Award of garden Merit (AGM). The characteristic large size of the young growth is exploited by gardeners: by pollarding the tree and ensuring there is vigorous new growth every year, massive leaves are produced (up to 60 cm across). These are popular in the modern style of gardening which uses large-foliaged and “architectural” plants. Alternatively it can be grown for its attractive, fragrant flowers. Growing conditions: a fast growing, medium to large tree, it does best in a sunny, reasonably sheltered site, preferably in moist, humus-rich, fertile soils. Protect young trees from frost. Can be pollarded. Very tolerant of atmospheric pollution. The ‘O’ in my A-Z of garden trees is a tree that has grown in popularity in the UK in recent years, though is a little tender. I have an olive tree growing in a pot in the courtyard here at Old School Garden. It’s a couple of years old and though producing fruit, these have not yet developed into anything edible…. Native areas: found in much of Africa and the Mediterranean basin, the arabian peninsula, southern asia and has been naturalised in many other places. Historical notes: The olive tree as we know it today had its origin approximately 6,000 -7,000 years ago in the region corresponding to ancient Persia and Mesopotamia. It later spread from these countries to nearby territories corresponding to present-day Syria and Israel. Olive oil has long been considered sacred. 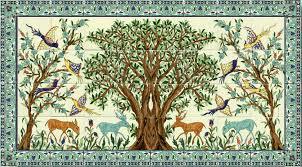 The olive branch was often a symbol of abundance, glory and peace. The leafy branches of the olive tree were ritually offered to deities and powerful figures as emblems of benediction and purification, and they were used to crown the victors of friendly games and bloody wars. Today, olive oil is still used in many religious ceremonies. Features: Olives grow very slowly, and over many years the trunk can attain a considerable diameter. One was recorded as exceeding 10 m (33 ft) in girth. 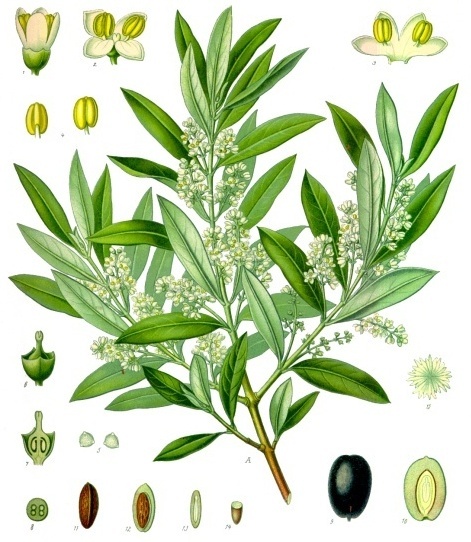 Olive is an evergreen tree or shrub. It is short and squat, and rarely exceeds 8–15 m (26–49 ft) in height, and are generally confined to much more limited dimensions by frequent pruning. The yellow or light greenish-brown wood is often finely veined with a darker tint; being very hard and close-grained, it is valued by woodworkers. A gnarled old olive- picture by Roberta S.
Uses: As a small tree with a rounded form, the olive can take on an attractively gnarled appearance as it develops and is a good choice for small gardens. It has small, but attractive leathery grey-green leaves and small, fragrant white flowers. They can be grown as half standards pruned to the classical Tuscan shape, or as full standards as well as more natural forms. They can benefit from a severe biannual prune in April, but as the fruit develops at the tips of the previous year’s growth you’ll sacrifice one year’s crop. These look especially good in teracotta pots and in Mediterranean style gardens. Growing conditions: If you have a protected city garden or live in a mild area, olives can be grown outdoors as long as you give them a sunny position and plant them in well-drained soil, for example, against a warm wall would be ideal. In cold or northern regions winter protection in a conservatory for example, will be required. Once established they are extremely drought-tolerant, but plants will do better if watered regularly in dry spells during the growing seasons. To encourage strong growth, it’s a good idea to feed each spring with a general fertiliser, such as Vitax Q4. Olives naturally shed their older leaves in spring (April in the UK) as new growth begins. 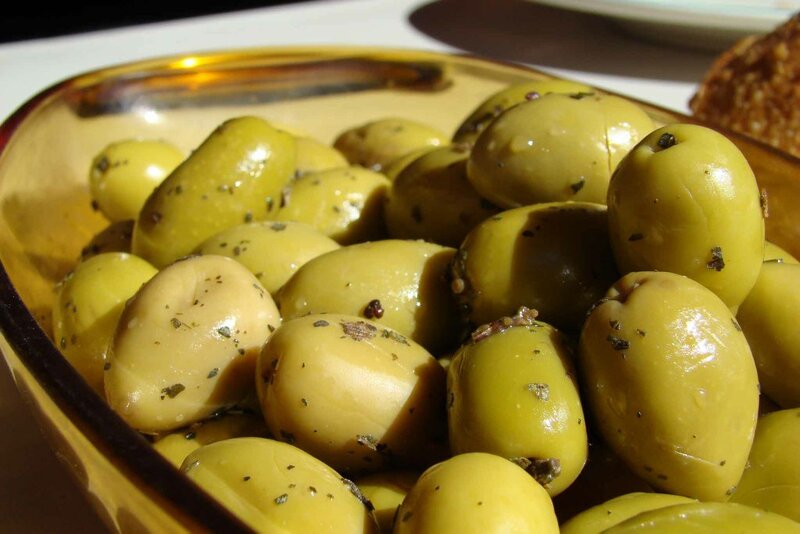 Olives are not entirely hardy in the UK, and will be damaged by temperatures below -10°C (14°F). 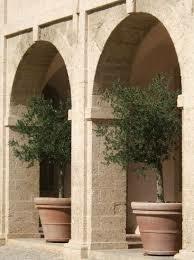 So, in colder areas of the country, you can grow olives in large (60cm, 24ins) diameter and depth) containers. Plant in a well-drained mix of compost, such as loam-based John Innes No 3 with 20 percent by volume added horticultural grit. 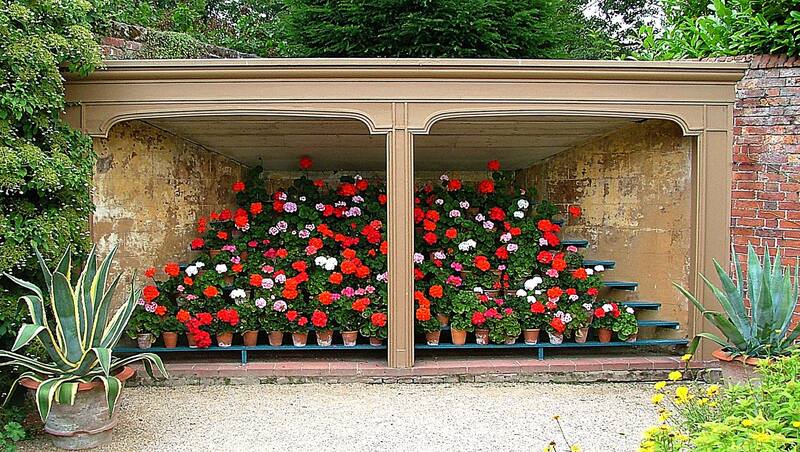 You can place containers outdoors in summer and then move into a cold conservatory, porch or greenhouse over winter. Although they can cope with dry periods, olives in containers need regular watering and feeding to produce fruit. During the growing season keep the compost moist and feed with a balanced liquid fertiliser such as Phostrogen or seaweed, every month. In winter, you can reduce watering, but don’t let the compost dry out completely.